Our new 7 inch LED scoreboard can operate all day from this external rechargeable battery instead of using AC power. Operation is as simple as plugging the pre-wired battery into the side of the scoreboard instead of using the AC adapter. Runs the scoreboard for 10-12 hours at full brightness. At slightly reduced brightness, the scoreboard will run about 20 hours. 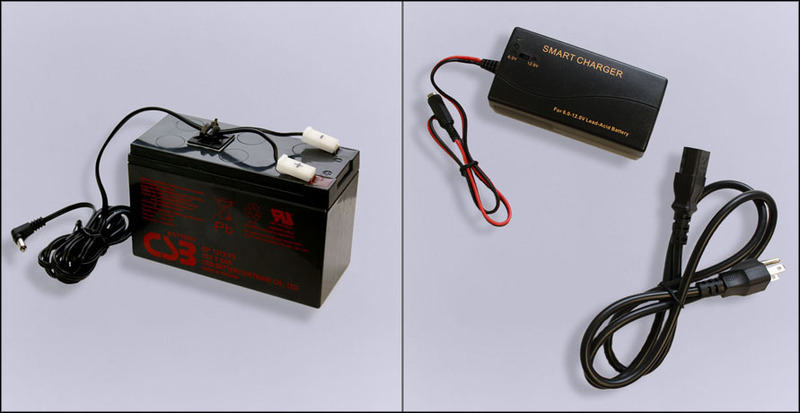 Battery specifications: 7 amp-hour, sealed lead acid (SLA) battery. Size 6 x 3.75 x 2.5 inches. Weight 5.5 pounds. The smart charger recharges an empty battery in just 3 to 4 hours. You can safely charge the battery at any time without regard to how discharged the battery is – the charger will properly top off the battery even if the battery is not fully discharged. The battery will only power our battery-ready 7 inch LED scoreboard. If your 7 inch LED scoreboard has a built-in AC power cord, it is not a battery-ready version. The battery will not power any versions of our 10 inch LED scoreboard. The scoreboard battery and charger are available for purchase as a set or individually (if a replacement is needed). Do not use a different battery or charger than the ones sold by FarmTek. Note: The external battery can only be used with our new, battery-ready 7 inch LED scoreboard. The battery will not operate older models of the 7 inch scoreboard which have a built-in AC power cord. The battery will not operate any model of the 10 inch LED scoreboard.